Quick recap of Part 1 since I wrote it 3+ months ago. This article talked about a study which reported that pitchers who threw with excessive contralateral tilt could produce more velocity than those who didn’t tilt as much. This extra velocity came with a price which was more joint forces at the elbow and shoulder which could lead to an injury. The amount that each pitcher tilt’s is going to dictate which arm slot they use since the arm should always be at 90100 degree angle from the trunk in order to maximize force and minimize injuries. I moved to Kelowna from Vancouver (about 400km/250 miles apart) – started a new job as a strength coach and I am starting to work with some local baseball teams. Both of which I am very excited about. The more I thought about this subject I started to think of more topics to discuss which is why this will turn into a three part series. Based on the information from Part 1 it looks like throwing with more of an over the top arm slot which requires excessive contralateral tilt allows you to throw harder. Even with the extra stress on the elbow and shoulder I think that most pitchers would be willing to take that risk in order to throw harder. However each pitcher must select the arm slot that allows for the best chance at success since there is more to pitching than throwing velocity. Velocity is VERY VERY VERY important but it is still a only one piece of the pitching puzzle. Some pitchers select their arm slot because it allows for more accuracy and/or movement even if it doesn’t allow for optimal velocity. This a choice each pitcher and pitching coach has to make. A lot of MLB organizations will take some of their pitchers and get them to throw with different arm slots that aren’t as common in order to increase their effectiveness and become a specialist out of the bullpen. These are pitchers that have enough ability to play professional baseball but are maybe lacking a bit of velocity or skill to make it as a “normal” thrower. The authors of the study determined the amount of tilt each pitcher had based on the position of their head in relation to the landing foot at the point of maximum external rotation. I loved that the researchers provided us with an easy to use tool that just about anybody can use. Simple and non-complicated tools are great but I wanted to bring up a couple of points that we should consider before we start to classify our pitcher and their tilt. If we measure tilt based on the head position in relation to the landing foot then we should look at where the foot is landing. If you land with either an “open” or “closed” position this is going to change the amount of tilt that you display since the foot is the reference point from which measure. A righty that lands in an “open” position towards first base and still display’s tilt is going to be different than a pitch you lands with their foot in a straight towards their target. Landing position is a topic for another article all together but just be sure to make note of it as well as tilt. Where’s this Tilt coming from? Knowing how much tilt a pitcher has is great but the term “trunk tilt” is a little too general. The term “trunk” here refers to our spine which runs all the way from the base of our skull to our hips. Because this structure is so long we need to figure out where exactly the tilt is coming from. 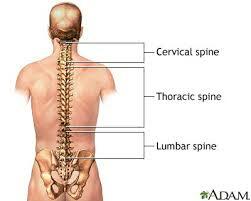 The parts of the spine that we really need to consider are the cervical, thoracic and lumbar spine. The other regions of the spine (sacral and coccygeal) don’t provide any movement so we know that we aren’t getting tilt from here and if you are you’ve got bigger problems. The reason that I am getting into more detail is that some portions of our spine are made to move and tilt more than others. This steams from a concept I’ve come to learn and appreciate from my job as a strength and conditioning coach. The concept is called the Join-by-Joint theory and it stresses how each joint in the body is designed primarily for either mobility or stability. 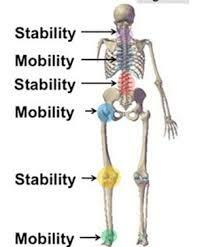 In reality each joint has some mobility and some stability but the amount of each is definitely not 50/50, if a joint has a lot of mobility it will lack stability and vice versa. Look at the shoulder joint for example. It is probably the most mobile joint in the body but because of that it is very unstable which is why we spend so much time working on shoulder stability exercises. If you look at the picture above you’ll see that the lumbar spine in red is labelled as a “stability” joint which means that we shouldn’t be getting much of our tilt from this area. If you look at the muscles associated with the lumbar area you would find the “core” muscles and their role during the throwing motion is to transfer energy created from the lower body and funnel it towards the upper body. 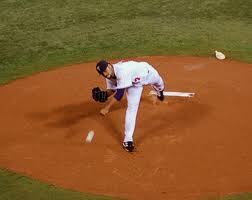 Higher levels of stability here will allow a more efficient energy transfer which leads to higher throwing velocity. Tilting from the lumbar would compromise its stability due to the fact that you are asking it to be mobile and not only will it decrease the amount of energy you can transfer (energy leak) but you’ll be placing yourself at a higher risk of injury when you ask a joint to do something that it isn’t designed to do. Moving up the chain to the thoracic spine we find that it is labelled as a mobile joint. The term mobile here is relative because their isn’t a ton of movement between the vertebra of the thoracic spine but in comparison to the other segments of the spine they are mobile. The importance of T-Spine mobility is a topic that has been covered before however it’s importance is usually stressed in either the sagittal and transverse plane and not so much the frontal plane. Sagittal mobility is important because most of our daily activities have us sitting down which increases the likelihood of you hunching forward which compromises our ability to extend. This ability to extend helps amplify the amount of external rotation you get at the shoulder joint which can lead to faster fastball’s. Transverse mobility through the t-spine can buy you some extra degrees of hip and shoulder separation which can also lead to, you guessed it, harder throwing ability. When we look at tilt however we are looking at frontal plane mobility which looks to be important as well if you want to throw with a high arm slot. Great Tri-Planar T-Spine Mobility Drill for those how lack it. Be sure to not to move through your lumbar spine here – keep those hips steady!!! Moving further up the spine we find the region called the cervical which is labelled as a stable joint. While our neck can move quite a bit (think of nodding your head in a “yes” fashion up and down as well as a “no” fashion going side to side) all of this mobility is coming from 2 of the 7 cervical vertebra. These two vertebra are called atlas and axis and are specifically designed for these movements. The remaining five don’t provide much mobility at all and are thus designed for stability. We don’t end up using this stability to transfer energy like we did with the lumbar stability because we have transferred that energy out towards our shoulder and elbow joints ultimately ending with the wrist and finally the baseball. This lack of mobility means that the cervical spine is going follow the thoracic spine so if your trunk is tilted there’s a good chance that your head will be tilted too. The implications of this are that if your head is tilted this means that your eyes are going to be tilted too. This non-level eye sight line might make hitting your target a little tougher but with a lot of practice talented pitchers can make this adjustment. Especially if it means more velocity. Part Three will dive it the rotation vs linear power talk and discuss what type of tilt might be best for you. 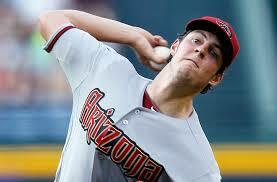 Throwing with an Over the Top Arm Slot is Faster But More Dangerous!!!! Wanna Get Drafted Out of High School? Here are the physical stats of players that did. How do you compare? ?